If you've noticed water, dirt, or rodent droppings in your garage, there's a good chance the problem can be traced back to your garage door. 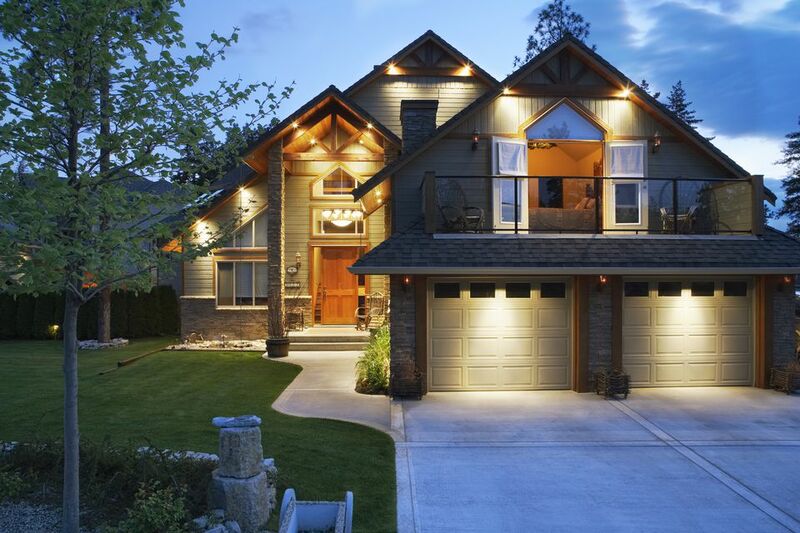 Garage doors are very large, and while all come with a bottom seal to keep out water, wind, dirt, and unwanted intruders, the seals themselves can break down over time. In more extreme cases, the concrete floor or driveway apron under the door can shift, crack, or settle, creating large gaps under the door that standard seals can't cover. Weather-sealing a garage door usually involves a simple process of adding or replacing the bottom door seal and the weatherstripping on the stop molding along the sides and top of the door. It may also include adding thin weatherstripping between the door panels​ if you want to make the door as airtight as possible. Garage door bottom seal for wood doors. 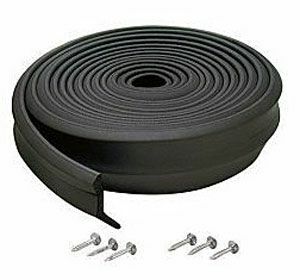 The garage door bottom seal (or door sweep) is a long strip of rubber or vinyl that attaches to the bottom edge of the garage door. The flexible material compresses when the door closes, sealing the gap along the floor to keep out water, dirt, cold breezes, and critters. You'll know it's time to replace the bottom seal when you can see daylight below the bottom of the door when it is closed. Wood garage doors typically use a simple strip-style seal with angled edges that seal against the front of the door and the floor. These typically are installed with galvanized or aluminum roofing nails. Metal garage doors typically have an aluminum channel on the bottom of the door that holds a U-shaped rubber gasket, sometimes called a T-style or astragal seal. The gasket simply slides into two small tracks on the channel for installation. You can also install metal gasket channel onto a wood garage door so you can use this type of gasket. In addition to their easy installation, the best thing about U-shaped gaskets is that they come in different sizes to seal gaps of various heights. This can be an easy solution for large gaps created by sunken or cracked garage floors. A threshold seal serves a similar function to the bottom seal on a garage door, but it is attached to the floor rather than the door. Thresholds can be used alone or in conjunction with a door seal. Thresholds often are used to keep out surface water when a driveway slopes down toward a garage. They can also help fill a large gap below a door. A good-quality vinyl threshold seal can be more durable than a door seal. It is installed with an adhesive that is usually included with the threshold. Keep in mind that thresholds block water going out of a garage, just as they keep it from flowing in. This can be inconvenient if you like to hose out your garage. A threshold also makes it difficult to sweep dirt and debris out of the garage. Wind and rain can also get into the garage around the sides and top of the garage door. To prevent this, garage doors usually have rubber or vinyl weatherstripping installed onto the wood door stop molding that is attached to the door jamb and nearly touches the front face of the door. Install new weatherstripping onto your door stops if your garage door doesn't have it or if it has old, worn stripping that no longer seals against the door. New weatherstripping comes in rolls, and you can easily cut it to length with a utility knife. It installs with galvanized nails or screws. The door-side flange of the weatherstripping should press against the door to create a good seal. Door stop molding with weatherstripping is a great option for doors that have old, rotted or damage door stops that need replacing. This specialty stop molding typically is made of vinyl and has a wood-look molding strip and a flexible weather-seal flange all in one piece. It cuts easily with a saw and installs with galvanized or stainless steel siding nails. To install the door stop, position each piece parallel to the door face, and push the molding toward the door so the weatherstrip flange is slightly compressed against the door, then fasten the molding to the door jamb with nails. Typically, it's best to install the top molding first, then overlap the ends of the top molding with the side stops. Door panel weatherstripping is sold in rolls and is self-adhesive. You simply stick it to the top or bottom edge of each panel. When the door is closed, the panels compress the weatherstripping to create an effective seal, much like weatherstripping on standard house entry doors. Is Garage Insulation Different From House Insulation?